The papers of Ivan J. Houston have recently been processed and are open for research. Houston was born in Los Angeles, California in 1925. He worked at Golden State Mutual Life Insurance Company for forty years, becoming the company's President and CEO in 1970 and Chairman in 1980, a position he held until his retirement in 1990. In 1943 he enlisted in the Army and in 1944 he was assigned to the 3rd Battalion, 370th Infantry Regiment Combat Team, 92nd Infantry Division of the U.S. Fifth Army, also known as the Buffalo Soldiers. Houston's battalion journal became the basis for the memoir he published in 2009, Black Warriors: The Buffalo Soldiers of World War II. 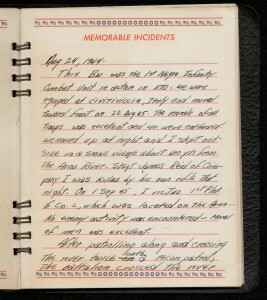 The collection consists of documentation of Houston's World War II service; records of his tenure with Golden State Mutual Life Insurance; materials related to the creation of Black Warriors; various periodicals, programs and annual reports that feature Houston, and his personal papers, photos and slides, including materials related to his father, Norman O. Houston and his mother, Doris Talbot Young.